Eastwood is the only girl’s team standing. The young Troopers finished third in the Region 1-5A Championship and advanced to state. 1. Eastwood: The Troopers are off to state. Running in Class 5A this year, Eastwood finished third with 127 points. Eastwood placed three runners in the top 30 – freshman Lauren Walls (seventh, 18:38.80), juniors Meadow Ortiz (17th, 19:29.30) and Eileen McLain (26th, 19:49.20). The team will race at the UIL State Championship on Nov. 3 in Round Rock. Eastwood is the only team still alive. 2. Franklin: The Cougars 2018 team run ended with a ninth place finish at the Region 1-6A Championship but not for sophomore Eva Jess who finished eighth in 17:46.05. She will advance to the UIL State Championship on Nov. 3 in Round Rock. Senior Amalia Dorion end her high school cross country career with a top 40 finish in a time of 19:12.21. 3. Americas: The Trailblazers finished 11th at the Region 1-6A Championship with 308 points. Junior Daphne Duran was the only top 30 runner, placing 27th in 18:43.40. The team’s average time 19:48.49. 4. Jefferson: The Foxes finished seven points short of moving on to the state championship, placing fifth with 143 points. Fort Worth Boswell earned the last spot with 136 points. Freshman Crystal Peterson was fifth in 18:33.00 and advances to the state meet. Freshman Monique Correa and sophomore Melody Tsuitsum had top 25 finishes. 5. Coronado: The T-Birds placed 12th at the Region 1-6A Championship with an average time of 19:51.43. Senior Jennelle Jaeger-Darakjy was sixth overall in 17:44.43 and will advance to the state meet. 6. Eastlake: Eastlake was ninth at the Region 1-5A championship with 177 points. Two runners, classmates Aeriel Garcia and Amaris Chavez finished eighth and 11th and qualified for State. The team’s average time was 19:54.30. 7. Socorro:The Bulldogs finished the season with a fourth place finish at last week’s District 1-6A Championship. Junior Jazmin Chacon did advance to the Regional meet where she was 55th in 19:26.58. 8. Burges: The Mustangs finished 13th at the Region 1-5A Championship. Burges had two top 40 runners – freshman Annette Guzman (19th, 19:37.70) and senior Natalie Jimenez (37th, 20:12.00). 9. Horizon: The Scorpions placed 16th at the Region 1-5A championship. Senior Kenia Enriquez was the top runner finishing 30th in 19:58.50. 10. San Elizario: The Eagles finished the season placing in 13th place at the Region 1-4A meet. Sophomore America Morales was 22nd in 12:45.40 (2 mile), just missing out on her second state appearance. El Paso’s distance runners had a competitive cross country season. From beginning to end, the races where always close. 2, Jennelle Jaeger-Darakjy, Coronado, 17:44.43 (Mae Simmons Park, 10/22). 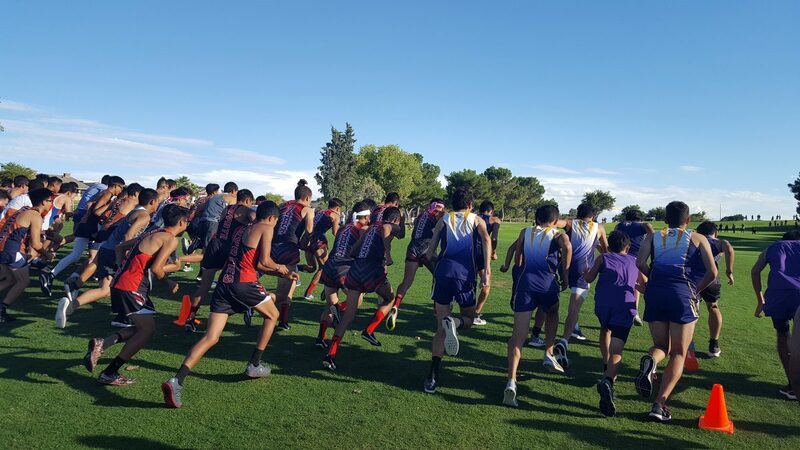 The season took runners to some beautiful courses such as this one at the Don Haskins Recreation Center hosted by Franklin. 3, Aeriel Garcia, Eastlake, 76 (2).